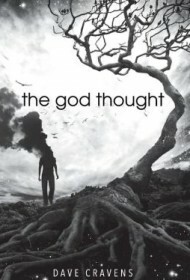 With The God Thought, Dave Cravens delivers an action-packed thriller with a science fiction bent. Accountant Oliver Wells has lost his wife and daughter in a plane crash, supposedly the result of a fertilizer plant explosion known as the Bloomington Blast. But the blast, Oliver learns, was not the result of a chemical accident, but of one man’s mind. Just before the blast, a farmer, paralyzed and confined to a nursing home, had “the god thought,” a moment of clarity so powerful it unleashes massive forces of creation and destruction. This god thought also spread to others, manifesting as shared dreams and remarkable powers. Oliver finds that he is one of those the god thought has touched, giving him superhuman psychic strength. He also discovers that several shadowy groups, working together as the Collective, want to harness his power. But even they face a formidable enemy: a strong, seductive and vicious woman who claims to be the farmer’s wife. Interwoven with the main narrative are transcripts from a radio show called Zero Hour, on which host Conspiracy Carl and his sidekick, Devin, investigate the truth behind the Bloomington Blast. They get the scoop of a lifetime when an informant from the Collective, known as WHiSPER, calls in to the show. Both men soon find, though, that WHiSPER’s information comes at a high price. Cravens keeps the excitement and twists coming throughout The God Thought without letting the plot get convoluted, and his characters, though not entirely three-dimensional, are well-developed enough to inspire sympathy and interest. The Zero Hour “transcripts” are especially well done, and add a different, cerebral kind of suspense to the more action-oriented Oliver Wells storyline. Fans of Dan Brown’s Robert Langdon novels and such Michael Crichton works as Sphere and The Terminal Man will find much to enjoy in The God Thought.